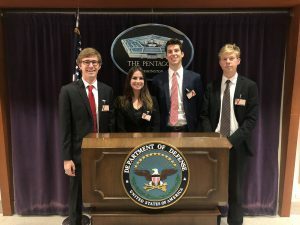 The H4D course is part of a wider initiative at Batten’s National Security Policy Center (NSPC), led by Professor of Politics and Public Policy Phil Potter, to engage directly with the policy and defense communities. 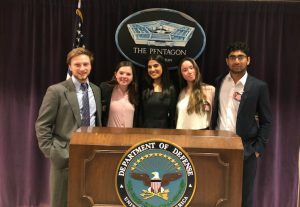 This fall’s class was the result of a partnership between Batten and the MD5 National Security Technology Accelerator, a DoD organization that builds new communities of innovators to solve national security problems. Batten Professor of Public Policy Brad Carson is the lead instructor for the H4D course and will continue to lead the course next year. As a former congressman from Oklahoma and Under-Secretary of Defense under the Obama administration, Professor Carson brought a wealth of defense and policy experience to the classroom. Brian Pippert with the Defense Logistics Agency worked closely with the students to refine and narrow the problem before working on solutions. A key part of this process included conducting interviews with stakeholders. Pippert arranged for the students to interview employees and leadership from DLA Troop Support Subsistence, DLA’s prime vendors for Korea and Alaska, a manufacturer of Meals, Ready to Eat, contracting officers, an FBI agent, and experts from the DoD Cyber Crime Center. He also shared policies and training information with the students and answered their questions. Professor Potter and the NSPC will continue to refine and expand the program next year. Next spring, Potter will lead an MPP version of the course in partnership with the Law School and School of Engineering and Applied Science. This format and partnership will allow students to tackle complex problems that have a combination of policy, technical, and legal dimensions.